From the Warp: Which is better, Legion or Chapter? Which is better, Legion or Chapter? With Forge World releasing the start of the Horus Heresy books providing us gamers with a whole new world, I started thinking about the time period that I enjoy the most as it relates to the background or more simply, what's more cool... a space Marine Chapter or Legion? For me, I have to say it's a Legion. As luck would have it, my friend let me borrow his copy of Book One: Betrayal to look through. He told me his initial impression was that it was "alright," which is not what I expected him to say about the book. Turns out, my copy arrived the very next day. I've spent the last few days going through the book from a background and "look at the pretty pictures" perspective and I have to say that I am not disappointed. It only covers four Legions, Sons of Horus, Death Guard, World Eaters and Emperor's Children, but I'm a sucker for little nuggets of background info and pretty pictures. After building that one Sons of Horus terminator I did the other week, I'm really starting to like them as a force. I think their color scheme is cool and the whole idea of a Legion just connects with me and how I view Space Marines. I do like the shade of blue they used for the World Eaters though, that slightly lighter and a bit more muted blue gives them a completely different feel. That and the ornate armour for the Emperor's Children makes them stand out as well. I did look at some of the actual rules for the Legions ( I was looking for more artwork), but I'll be honest, I get more excited about the stories and images more than anything else. I love the idea of massive Legions moving throughout the galaxy in a time when they knew what had to be done and they had a clear goal. These guys were on a mission and nothing was going to stop them. They were expanding the limits of the Imperium and destroying whatever got in their way that ran counter to their goal. Space Marine Chapters today just seem so watered down. Like they're living off of their past victories and history. Nobody stands out like they used to. Each chapter is just another one like the previous one. Maybe it's just me. I like that each Legion has a certain feel and look to it. From combat style to armour and everything in between. It feels like a time when you could be proud to say you belonged to the Sons of Horus or the Emperor's Children. Saying you're part of a particular chapter now just doesn't have the same effect for me. Army building: Do you build what you really want to? Hey Ron, I could not agree more! So much so that I have a post conveying the same idea scheduled for tomorrow on my blog. I knew I was gonna have a problem the day FW announced the Horus Heresy book series. As I am on the Lore/fluff centric podcast I must admit a real love for the Great Crusade/Horus Heresy era in the background. It is so interesting, how could you not want to fight battles in that setting? I look forward to seeing where you go with this!. This is why the Dark Angels are the best chapter... because they aren't really just a chapter. The call of a heresy-era force is a pretty strong one, I'm not sure I'll be able to hold out when FW eventually get around to covering the battle of Calth. For me, though, when it comes to loyalist astartes, I'm generally far more inspired by the more obscure chapters with no obvious legion lineage. When I inevitably get sucked into painting and modelling a force of the corpse-god's servants, it'll be Star Phantoms. Distinct aesthetic, fascinating nuggets of background and a free hand for fluffing out and making up charcters and campaigns. In short, I may be in a minority here, but I'll go for chapters over legions most of the time. and my termies use the 'new' resin lightning claws from GW as they are much better than the rediculous knuckle duster ones they have in plastic now, and my thunder hammers are from the tartaros kit.... so yeah not cheap neither. Yeah, for the non first or second founding chapters there are only so many "flavors" of chapters, I.e the "dieing ones", slowly being destroyed by attrition, the cursed ones, who have to deal with constant misfortune or mutation, the "repentant ones" crusading for an earlier mistake, or the well equipped ones, who are ultramarines in all but colour or some quirk of organization. It is nice to have the distinct legions as you say. I don't know if I would call all of the Space Marine Chapters watered down per say. Certainly when we look at some of the codex adherent chapters. But looking at the ones who have endured since the Heresy is very cool. Space Wolves for example, who to this day maintain everything they stood for back in the heresy. Though this is likely due to Bjorn's maintained presence as the chapters moral compass. Even still, they and many others still stand proud after the Heresy and that's why I have to lean to Chapter for the most part. Their history defines them. I think I prefer chapters. There are just so many that they all become their own culture. They have a very long history spanning over thousands of years and many don't even know who they are descended from. that being said, the legions are still awesome. Big Jim: Exactly, there's just so much more to the universe at that point it feels like. Meigeall: I love the Dark Angels myself, but the more I get into the background, the more I find myself drawn to the loyalist chapters before they turned. Zab: Yes, bathrobes and all. It builds character they say. Bog Witch: Interesting. There is something to be said for the freedom afforded by a lesser known chapter. There is some info there, but not so much as to keep you from adding your own touch. cpt codpiece: Mentor Legion... there's a force you don't see often. It sounds like you have your work cut out for you going the old RT route. Bigglesworth: Distinct. I like that way of saying it. There are only so many favors or twists you can put on it and then it just starts repeating itself it seems. Anon: Space Wolves may be one of the exceptions. They have a strong background and have not "changed" much as the game has in my perception. I don;t know about the rules. Even then, I would take a pre-heresy or heresy era Wolf force before I took a current one. I imagine them being even tougher in the beginning years. cpyke: A great point... many have forgotten where they came from. I've gotta say the color scheme for the Warhounds (pre-Angron) might be my favorite armor scheme I've ever seen. So far, the HH has pushed me in the direction of an old love - Iron Warriors. I can no longer resist the pull of the Typhon Siege Tank, so I have to get one as my Christmas gift to me. Hopefully the next book will take the IW in a good direction. yeah, i thoght the RT mentor legion would be a hard sceme too, turns out its quite simple :) and i really enjoy painting it. here is my 1st WIP (its on my FB, sorry). took about 2 hours including building and spray priming, im quite happy with the white but may develop it a little more. 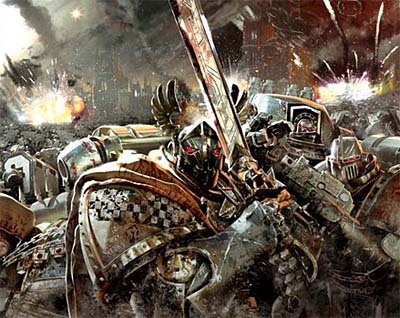 Brandon Griffith: Iron Warriors huh? Their an army you don't see very often out there. Hopefully one of the next books will bring them up to speed as well. cpt codpiece: There's the trick... finding a force you enjoy painting. I wish the pic wasn't so blurry, it looks like you've done a great job on the white armour. the white is just tamiya haze grey spray, then ulthuan grey on top, then layered on with white on the highlights. then a simple grey wash on the line work and shadows. I'd love to see how it comes out when you're done. Sounds like you are a fluff fanatic just like myself and most of my friends Ron. As for the discussion at hand. I can see both sides of the argument. The legions where incredibly distinct and cool yes. That doesn't mean that each chapter can't have nuances that set them apart and make them extremely interesting as well though! Take any one of those chapters that looks interesting. The Reaper's for instance. What is their backstory? Where do they come from? Do they even know who their successor chapter originated from? Can they trace themselves back to one of the founding legions? Yep, the background is where it's at. I agree that Chapters can have their own subtle nuances, but it's just not the same for me. Legions just call to me way more than Chapters do. That pic made me think about crimson fists, RT era... when they and other guys, like mentors, flesh tearers, etc. were "propper" marines. Legions all the way. They existed in a much colorful background, where they were meant to push the boundaries of known space, finding all kind of weird stuff (and killing it) in the name of mankind. "Proper marines"... I like that. I wonder if it's the players who have been around a while (since the RT days) that like the Legions more than Chapters. I wonder if new players are drawn to the Legions at all or stick with what they know of the game as it is today. I am starting up a Space Marine Chapter, using Smurf rules, but they are quite different. This post has given me some ideas. Originally, they were going to be a chapter, but I think a Legion would be better for the story. They get out, and they fight some realspace daemons and they are like little kittens compared to the EYE of freaking TERROR Daemons. My chapter will have a Preferred Enemy: Daemons/Chaos house rule. As for your question regarding time, I'm not 100% certain as to how many years it would have been in real space for the timeline you have in mind. Exactly when did they get sucked into the Eye? Was it before or after the emperor's internment on the golden throne? Also, one of the great things about the Warp is it distorts time. Your Marines could have been fighting for hundreds of years in the warp only to have it blink by in a couple of years in real space, or it could have been just the opposite! I always thought that was cool too... the change in time for those inside the warp. What is one year for someone might be hundreds for another. W3aponiz3d... GENIUS!!!! Now I don't have to worry about when!!!!!!!!!!!!!!!!! And thanks! I like to write, and I like to Warhammer, so the two usually come together. I have written stories for all 3 of my races, as well as custom character backgrounds and profiles, and other people's themed armies! Maybe I can write some for this community too! For free of course. YAY WRITING!!! To me, the fundamental difference between 30k and 40k is that there's still that sense of optimism in 30k. At least in the pre-heresy period. I mean come on ... there are demi-gods leading thousands upon thousands of marines along side untold numbers of human allies in the Imperial Army. Sometimes the grimdark universe can just be too much and this setting provides a nice difference. Well put and an aspect I never thought of. I think GW needs to really differentiate 40k from 30k a bit more. Keep in mind that the gap in time they are talking about is wider than the gap between modern special forces units and. Roman foot soldiers by an order of magnitude. I actually like how rare space marines are supposed to be in 40k. It makes the heresy era seem like mythological epics., which is how it should feel. Zero: Good point. 10,000 years is a substantial gap in time. I to like how rare they are supposed to be, but I've never had that feeling with them unfortunately. Maybe that's because so many people play them as an army.